Hello Duelists! This past weekend World Superstars was released and it gave us some pretty amazing cards, or so I thought. The Star Seraphs were probably the most anticipated cards to be released this weekend, and after attending a 9 round Regionals (which I would end up winning - so I had plenty of time to look around at the top tables and see how the Seraphs actually played out) I have noticed that they actually have a lot of problems. Star Seraph Scepter - When this card is Normal or Special Summoned: You can add 1 "Star Seraph" monster from your Deck to your hand, except "Star Seraph Scepter". An Xyz Monster that was Summoned using 3 or more monsters, including this card on the field, as Xyz Materials gains this effect. ● When it is Xyz Summoned: You can target 1 other card on the field; destroy it, and if you do, you can draw 1 card. Star Seraph Sovereignty - Cannot be used as an Xyz Material for an Xyz Summon, except for an Xyz Summon that uses 3 or more monsters as Xyz Materials. If you Normal or Special Summon a "Star Seraph" monster(s), except during the Damage Step: You can Special Summon this card from your hand, and if you do, draw 1 card, then you can Special Summon it if it is a "Star Seraph" monster. Opening with Sovereignty and Scepter just may be one of the strongest openings in the game. If you go second you get to draw 2 cards, and then if your opponent has a card on their field you get to destroy a card and draw a card. Then you can still use the rank 4 monster’s effect (usually Delteros or Ourobouros) which gives you a whopping 3 new cards in hand, and they are going to have at least 2 less cards (1 for Scepter and 1 for Delteros/Ourobouros). The biggest problem is just drawing awkward combinations of these cards. Just drawing Sovereignty in your opening hand doesn't do anything, so that's a -1 until you draw Scepter, and drawing 2 Sovereignty is possibly even worse since they can only be used for a 3 material rank 4 xyz. Just drawing Scepter isn't very good unless you have another Scepter or you have a Call of the Haunted, because then you're left with the same problem of just having a Sovereignty until you can get to another Scepter. However, the biggest problem with Seraphs is that they're awful against the best deck but good against decks that aren't the best deck. When playing against Nekroz them summoning Nekroz of Unicore is very deadly, since Scepter says that the monster you summon gains the effect to destroy a card, Unicore automatically negates that effect and you don't destroy a card on the field or draw. An even bigger problem vs Nekroz is that the deck will often choose to go second, giving you less chances to open up with both combo pieces. Additionally, Nekroz will often clear their field to avoid opposing Trishulas, meaning that even if they don’t have a Unicore up, you still won’t be getting full value out of your cards. The best you can hope for is drawing two cards and maybe hitting something out of their hand with Ouroboros - but this leaves you vulnerable to Trishula. Now this is the deck that most players were anticipating using the Seraphs in, but I don't really think it's worth it. The Seraphs really shine when you're going second, because that way you can pop a card with Scepter and even Delteros if you summon him, but Satellarknights want to go first so that they can set their trap cards and control the game. There's also a huge conflict that occurs when you put the Seraphs in your deck as the Seraphs use up your normal summon, and Satellarknights also use up your normal summon. What this means is that you're playing more monsters and in order to play more monsters you have to cut trap cards. Now let's say you open a hand of Satellarknight Deneb, Satellarknight Unukulhai, and Scepter, not exactly an unlikely hand. Since you've added more monsters to the deck you're starting out at a -2 (because you can only summon one) more often than before. This also means that your opponent has less trap cards to play through which makes their life a lot easier. Another question that you need to ask yourself is do Seraphs actually increase the ceiling of Satellarknight? They allow you to make Rank 4 plays just like Satellarknights do, and help you to maintain advantage through the use of monster effects, but if the Satellarknight deck already does these things why do you need another engine that adds normal summons to the deck to do the same thing. Sure the Seraphs have some cool interaction with Call of the Haunted but isn't reborning an Altair also good? The basic question that needs to be answered is, are the problems that the Seraphs bring to the Satellarknight deck outweighed by the good they do? As I stated earlier, the Seraphs aren't very good against the best deck (Nekroz) and when you're using a deck that isn't the best deck you should be building your deck to beat the best deck. This is the deck that I think can benefit from Seraphs the most as it gives the deck a solid amount of light monsters. 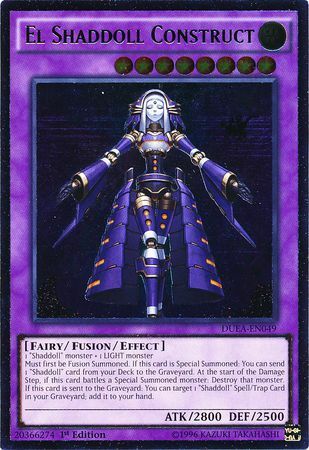 If you draw Scepter or Sovereignty alone you can just fusion summon for El Shaddoll Construct with them. Yes, the Seraphs give you more monsters that require your normal summon but this deck isn't as reliant on its normal summon compared to Satellarknight. Call of the Haunted also does have synergy with this deck since El Shaddoll Construct will get it's effect anytime it's special summoned (just like the Seraphs). Now if we ask ourselves the same question we did when using Satellarknight : Do the Seraphs increase the ceiling of Shaddoll? Even though Delteros doesn't have as much synergy with Shaddoll as it does in the Satellarknight deck I believe that yes they do. Shaddoll want to go second, drawing cards while putting up a board is extremely powerful since you run multiple floodgates and handtraps that make beating Nekroz much easier, and the Seraphs allow you to do that. That's all for this week's article! What do you guys think about the Star Seraphs? If you'd like to see me write about a certain topic feel free to message me on Facebook. The Circuit Series stops by Richmond, VA next on May 2-3! And As Always Play Hard or Go Home!